Diagnosis and Treatment of Movement Impairment Syndromes and Movement System Impairment Syndromes of the Extremities, Cervical and Thoracic Spines by Shirley Sahrmann and Associates. These two seminal texts make up the foundation of my Movement System Evaluation and training philosophy. Functional Range Conditioning (FRC®). Dr. Andreo Spina's FRC® system is a comprehensive joint training system with 3 main goals: mobility development, joint strength, and body control. I use FRC® techniques extensively to evaluate and enhance joint health, integrity, and resilience. Functional Movement Systems. I use specific protocols and concepts from The Functional Movement Screen and The Selective Functional Movement Assessment in my Movement System Evaluation. Mike Reinold and Eric Cressey: Functional Stability Training of the Core/Upper Body/Lower Body. The Titleist Performance Institute's Golf Fitness Screen. Administered to my clients looking to understand and improve their Body-Swing Connection and performance on the golf course. Who Should Assess Their Movement System? Understand how posture, position, and patterns of movement affect their performance, tissue quality, and joint health and longevity. Screen for potential 'red flags' - movement or joint dysfunctions that could lead to injury or need a referral for further diagnostics and treatment. Identify specific movement capacity deficits and select appropriate exercises and training goals before starting a new program or class. Optimize their daily movement practices, fitness routines, and/or strength and conditioning programs (based on the results of our MSBA). Learn the most efficient and effective movement practices to "bullet-proof" the body and reduce the incidence of pain and injury. Use objective data to measure current abilities and monitor future progress. Many motor tasks associated with particular sports/activities have movement system prerequisites - if you want to be able to do that, you must be able to do this first. By combining the principles of anatomy, physiology, and kinesiology (the basis for evaluating your movement system) with the knowledge of the specific motor skills, physical requirements, and key performance indicators of a given sport/activity, I will create a customized and sport-specific movement system evaluation for your small group or team. 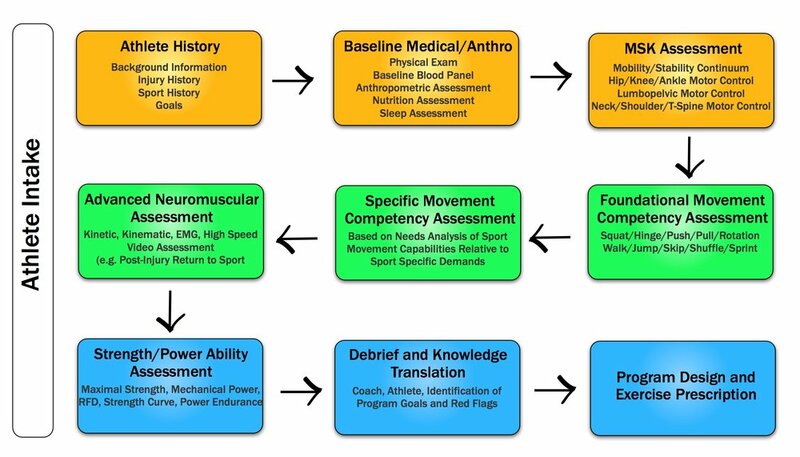 I want to help coaches, athletes, teams, and clubs identify their movement system impairments, imbalances, and opportunities for improvement through comprehensive assessments, educational workshops, and optimized physical preparation and training protocols. Want to do a Movement system evaluation for a Team or group?